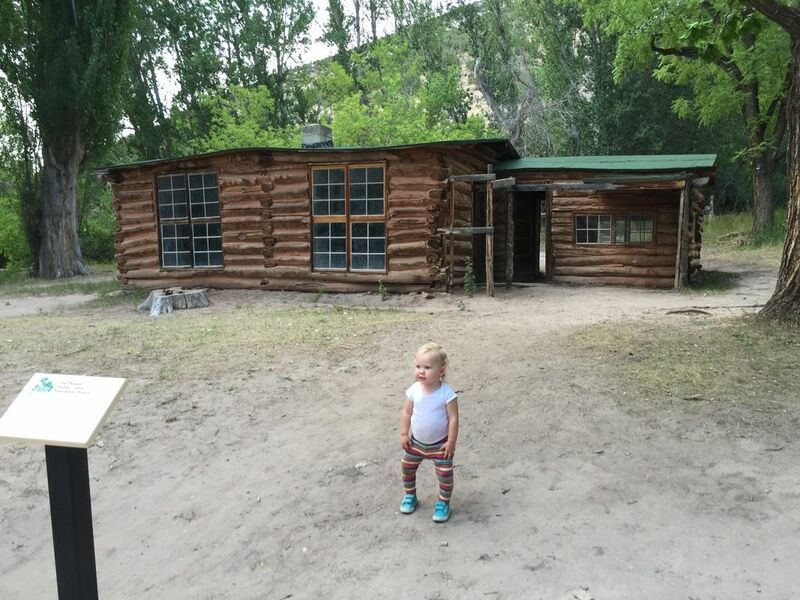 In the red, dusty belly of Dinosaur National Monument underneath expansive cottonwoods, surrounded by echo chambered box canyons and swampy lizard pits, sits the homestead of frontierswoman Josie Bassett Morris. A wood cabin with windows and floors made of powdery dirt rests in the shade next to a lawn of feeble grass and a remnant of a chicken coop. We made ourselves at home in the cove, pulled out a picnic blanket, made a spread of snacks, pausing to read the warning signs left there by the Park Service: BEWARE OF BEARS. THEY WILL EAT YOUR FOOD. My girls in particular are inspired by this spot. They pretend to be Josie going in an out of the cabin, tending to the once-viable vegetable garden and following the rocky trails leading out to where the cattle would be. Their imagination mingles with the plaques we read about how Josie, living alone after having married five times and divorcing four, spent her seasons, eating canned food in the winter and decorating her cabin with wildflowers in the summer. The sky turns dark and Erin looks up to the tops of the shaky trees, "We should stay in the cabin. It looks like it's going to rain." Christopher is napping on the blanket. The baby is buzzing around like the dragonflies we see by the pond. Anson wants to go back to the car and play on his phone. I feel a desire to hike into a box canyon and when I go out to explore a trail Ever and Erin follow me with bare feet. "Where did you put your shoes?" I asked them. But before they answer it starts to rain. We take cover underneath some trees but the rain turns into a downpour. It wakes Christopher up and he responds by scooping up the baby, the snacks and the blanket in one swoop and retreats to the car. "Like I said," Erin says with her pointy finger in the air, "we should've stayed in Josie's cabin." In seconds the sun returns behind steel-colored rainclouds and shines a light on the heavy, plopping rain drops. "This is a sun shower." I say to my girls who follow me back up the mud trail to the cabin. Everything is bright and wet. Across gravel road is a trailhead leading through a patch of trees. I can't see where it leads but I rally my family and after a change of socks and shoes and a promise to Anson that we would leave after exploring for a bit, we all head single file up the path. The baby is shuffling right along with us, her toddler bow makes her gait a bit more like the dinosaurs we saw back in the museum than a two-legged human. Christopher spots a long-eared rabbit and tries to catch a scuttling lizard. We see more dragonflies and swat at bugs swirling around our heads and feet. Pretty soon the trees give way to a majestic orange canyon, walled in by eighty foot walls of white rock. 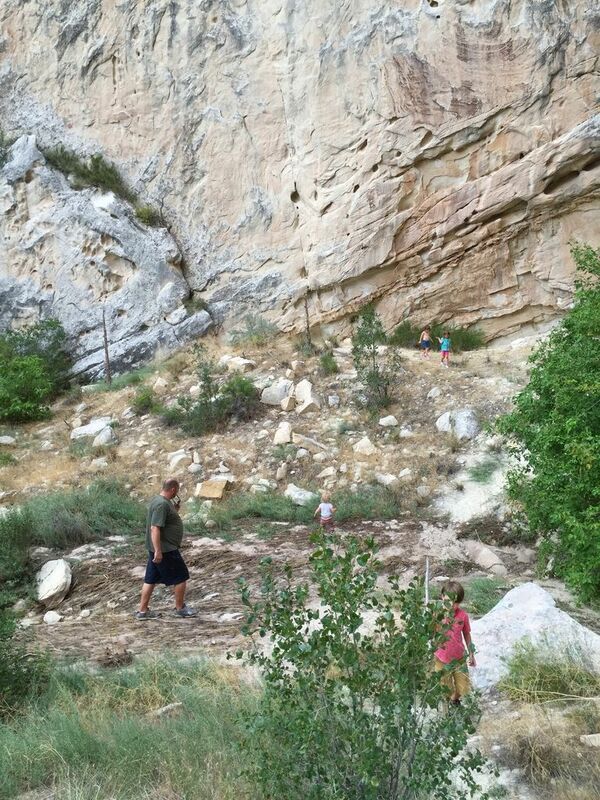 My kids take off before me to boulder and rock climb. The rocky trail turns into soft sand and we find a spot to sit in this desert paradise. This is home to me. The canyon walls stained by water run-off during flash floods and spring thaw look as much like my origins as my gabled room on Fir Avenue. 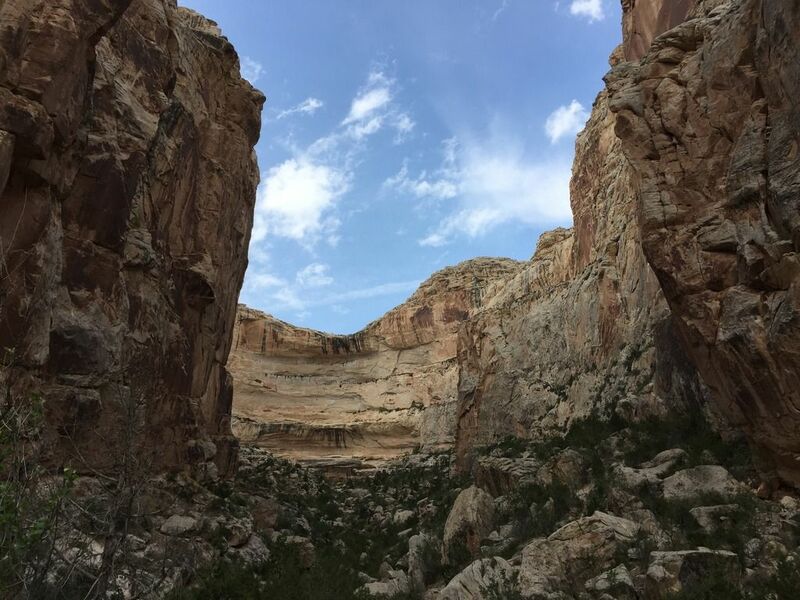 I think about Josie's practical and genius idea to corral her cattle in these box canyons--saving time and money by eschewing fences. I think about her resolution to live a decidedly non-traditional lifestyle. I think about all that time she had to work and be alone here with her horses and cows and wildflowers. Being alone is such a hot commodity to me, it always has been, but lately with growing children and a lifestyle full of human interactions I find myself daydreaming of canyons of silence, a cabin of quiet. Not forever, but just for an afternoon, or a lunch break, or an hour before I fall asleep at night. Anson is unhappy and let's me know. I sling the baby onto my shoulders and tell the others we'll meet them back at the car. We run down some of the way and end up at the bottom reading another posting about mountain lions: BEWARE OF MOUNTAIN LIONS. THEY WILL ATTACK YOU. As we drive away I think about how I can teach my children to be like Josie. I want them to live a life of self-sustainability, certainly, but also a life void of fear: of being alone, of transcending gender expectations, of abandoning hurtful traditions, of following their hearts, of bears, mountain lions, bare feet and the occasional sunshower.